CEDS is the ideal location for the IT Developer/Technical Analyst to start when determining data elements, definitions, and option sets for use in data integration projects, data visualization/reporting projects, and data warehousing projects. CEDS provides a vast vocabulary that can inform both the business and technical sides of development. How can CEDS help me with data integration? Align provides a bridge between two different datasets by aligning both sets to CEDS and then using CEDS as the bridge to see how those two datasets intersect. Align not only allows for element and option set definitions, but also includes a location for database and table naming, allowing for the alignment between the datasets to be viewed at a more technical level. How can CEDS help me build a P-20W data system? CEDS provides a Normalized Data Schema that can be used as a starting point when developing an operational data store (ODS) for collecting data from multiple source systems and staging data to a P-20W data warehouse. For more information about implementing the NDS, watch the following video: CEDS NDS. How can CEDS help me build a P-20W data warehouse? CEDS provides a Data Model Guide with examples of star schema data models used in a P-20W data warehouse. The NDS and star schema examples in the Data Model Guide are to show an approach for use with/within (not instead of) other standards or commercial platforms. How can CEDS help me determine naming for elements and option sets? CEDS has a vast education vocabulary containing elements and option sets from Early Childhood, K12, Postsecondary, Adult Education, and Workforce. The elements and option sets are derived from widely recognized standards that have been in place for many years. Using CEDS as a resource when adding or modifying elements and option sets in your environment can save time and resources over starting with nothing. How can CEDS help me with data visualization/report building? Data visualization requires a common set of vocabulary and definitions for the end user audience. CEDS can provide the common terminology to use when displaying data to a vast audience of stakeholders. Links to definitions for CEDS defined elements can be placed directly in the report, providing a resource to the stakeholder and eliminating the need to build a linkable data dictionary in house. What role does CEDS play for data interoperability and standards organizations that support the packaging and transport? CEDS leaves it to other standards organizations to define the standards for packaging and transport of data, application integration protocols, and content tagging/mark-up syntax. CEDS works with these other organizations for alignment of unit-level data vocabulary across education domains and areas of focus. You can explore these efforts by searching for the standards organizations’ shared maps in Align’s map-based reports. How can CEDS help me discuss data with practitioners (decision-makers, policymakers, researchers, etc.)? 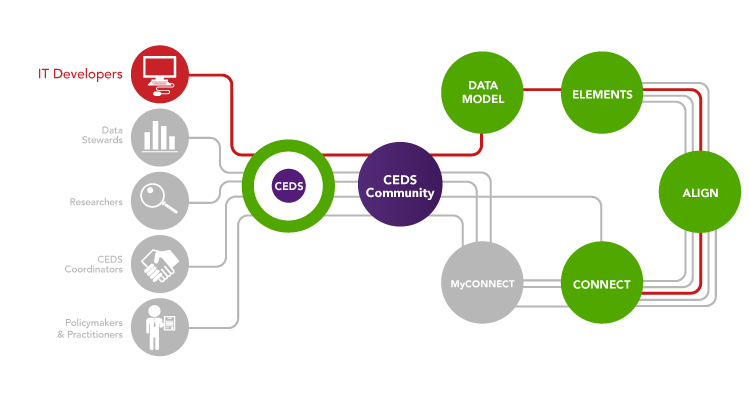 The CEDS tool, Connect, provides a context for defining which unit-level data elements can be used to answer research questions or to derive aggregate metrics used by decision-makers, policymakers, researchers, and other practitioners. Along with the element-level definitions, Connect can be a platform for common understanding about commonly defined unit-level data and the business rules for generating metrics and reports. To access support from your peers, join the CEDS Community.